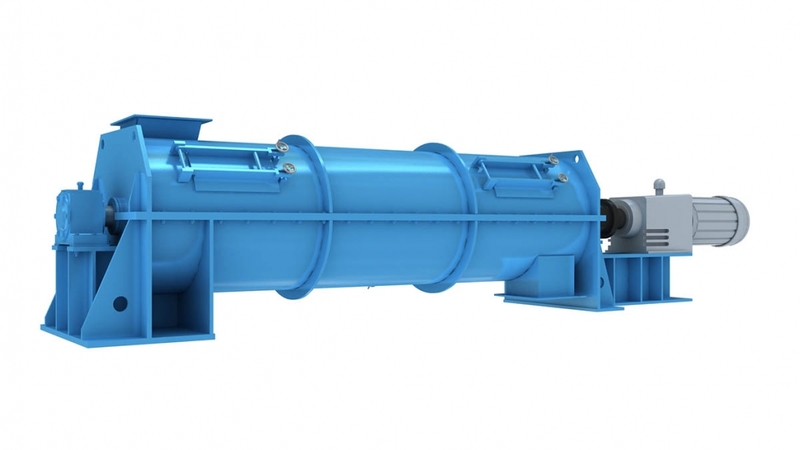 HQ series horizontal powerful continuous mixer is a patented product developed by our company to absorb foreign advanced mixing equipment. It has three kinds of mixing mechanisms, namely diffusion mixing, convection mixing and shear mixing, which overcomes the opposite segregation effect of the single diffusion mixing mechanism to ensure a high degree of homogeneity, so as to achieve the required degree of mixing, which can reach 85-95%, that is, the coefficient of variation V is not more than 5-15%. This series of general-purpose products are driven by a motor through a hardened gear reducer,and then gear coupling or hydraulic coupler,which will drive the hybrid rotor to rotate at a certain speed.The high-wearing mixing tool with special geometry is fixed on the mixing rotor.The mixing tools rotate so that the materials are mixed in the tank and can be continuously discharged, which can reach the final mixing target. Patented technology, the mixing tool is smart in structure, easy to replace and easy to maintain. This series of products is suitable for the mixing of two (and above) granules or powders with a particle size of more than 10μm, and the addition of a small amount of water or binder. It is widely used in metallurgical dust removal, sludge recycling and steel pellets, such as laterite-nickel ore, iron concentrate, magnesium oxide powder, aluminum bauxite powder. Mainly used in metallurgy, mining, refractory materials, coal, chemicals, building materials and other industries. 2.The characteristics of binder should be cleared such as addition, viscosity and density and added proportion. Note: The data in the table is calculated according to the average density of 1.1T/m3. When selecting the model, please combine the actual material characteristics and industrial conditions to select the most suitable product. with small volume, strong mixing ability, easy maintenance and safe reliability.